Despite international news coverage mainly focused on the violence in Afghanistan, Ehsan Bayat and the Bayat Foundation remain committed to rebuilding the nation by fostering a spirit of unity and peace among all of its citizens. Mr. Bayat passionately believes in the long-term goal of establishing an economically independent, wealthy Afghanistan, inhabited by a prosperous, happy populace. To achieve this goal, the Foundation continues to be very active in Afghanistan by taking on many reconstruction projects, including hospitals, dormitories, schools, and mosques, by helping orphans and widows, and by holding activities to bring the people together. The Bayat Foundation organized the first bike-a-thon in Afghanistan, which took place last year. The event was peaceful and very well received by Afghans; so much so that the decision was made to hold it again this year, along with a Peace Run. The Annual Bike Race, cosponsored by Coca-Cola and the Foundation, was held in the capital city, Kabul, on April 21. Over 1,000 people from all of the Afghan provinces participated. The race began at Darulaman Palace and ended at the Victory Arch in Paghman. 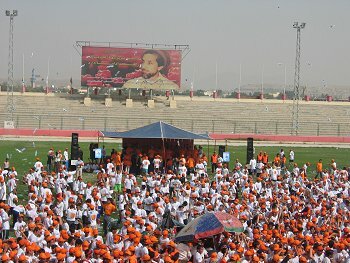 All of the participants in the 26-kilometer race, held to commemorate the Afghan Wireless Communication Company's (AWCC) fourth anniversary, were given T-shirts and caps. Cash prizes of 50,000, 25,000, and 12,500 afghanis were awarded to the first, second, and third place finishers. Fifty complimentary bicycles were also granted. The second event, titled the "Run for Peace and Unity," took place in Kabul on Aug. 25. It was organized by the Foundation, and co-sponsored by AWCC and the Ariana Television Network (ATN) as media partners. All participants in the 13-kilometer race, which went from Darulaman Palace to Kabul Stadium, received T-shirts, caps, and a cell phone SIM card. As the event title indicates, the rationale for organizing the peace run was to foster the spirit of unity and peace in all Afghans and ensure that the country continues to move forward in the momentous journey started four years ago to rebuild it. Approximately 2,000 people participated, including many dignitaries. It was indeed a memorable event for the people of Afghanistan. The 1,912 participants came from the following cities: Kabul (1,861), Kandahar (5), Heart (3), Jalalabad (26), Ghazni (4), Mazar (6), and Khost (7). Cash prizes of 50,000, 20,000, and 10,000 Afghanis were awarded to the first, second, and third place finishers. The first place winner also received a trophy. The third event organized by the Foundation to sponsor national unity was a fireworks show on Aug. 18, celebrating Afghan Independence Day (Aug. 19, 1919). For many Afghans aged 30 years or under, it was the first time witnessing a fireworks display. From the time of the Soviet invasion to rule of the Taliban, fireworks were banned throughout the country. "'I spent nearly three hours to arrive here to watch the fireworks. It is the first time I see fireworks in my life,' Ahmaad Chah, 25, said on Friday night, one day before the Afghan Independence Day." "The fireworks lightened the sky like beautiful and colorful trees, as many Afghans, who arrived there by car or walk, were watching nearby on the mountain. Chah, who lived in Paghman district, northwest of Kabul, spent two hours in a car to reach Kabul and walked nearly an hour to arrive at the mountain's top … 'We are happy and proud tonight because this is the night before the Independence Day,' said Chah. 'I hope all Afghans, especially women and children, can always enjoy peace, happiness, and stability in the future.'" "In the daytime of Friday, colorful flags could be seen established in many streets of Kabul, and there would be a grand civilian parade on Saturday in a major stadium in the city." The Bayat Foundation was established by Ehsan Bayat. The charitable organization is very involved in sponsoring a number of reconstruction projects in Afghanistan. Mr. Bayat also founded the Ariana Television Network (ATN) and the Afghan Wireless Communication Company (AWCC). ATN is currently the most watched television network in Afghanistan. Since its launch in Aug. 2005, the station has developed pioneering programming, including its cornerstone daily news programs in Dari, Pashto, and English, documentaries on the country's history and politics, and entertainment and educational children's programs. AWCC, the first GSM operator in Afghanistan, launched services in Kabul in April 2002. Its mission was to reconnect the people of Afghanistan with the rest of the world with a state of the art network and world-class value added services. Today, it offers one of the largest and most comprehensive roaming coverage in the region, and has established roaming relationships with over 326 operators in 118 countries.